Alive! Soy Shake Vanilla / 2.1 lbs - Nature's Way®. 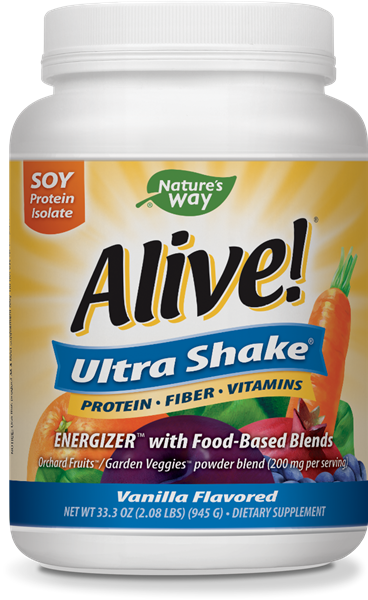 Alive!® Ultra-Shake® Soy Protein, our original soy protein multi-vitamin, is a comprehensive multi-vitamin with the added benefit of 15 grams of Solae™ soy protein.1 The powder is easy to mix with water, juice or milk – no blender required. Solae™ is a trademark of Solae, LLC. NutraFlora® and scFOS® are registered trademarks of Ingredion.